Here’s a easy one to mix up quick at the Tiki bar. It looks pretty and the chicks really dig it. Put everything in a shaker and shake it up real nice with ice, until the shaker gets frosty. 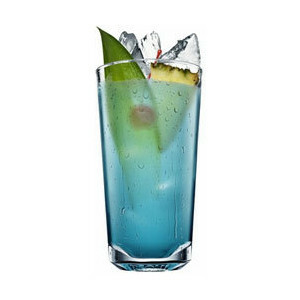 Pour it over the rocks in a Tiki mug and garnish with a piece of pineapple, and if you have it, a blueberry. Go to the music shop and buy a book on how to play saxophone. Learn to play the saxophone. Buy sheet music to My Blue Heaven, and record it with a couple of jazzing’ cats to a swing beat. Set up a record deal with a major jazz label and have the recording distributed. When it reaches the top of the charts, have it pressed in vinyl as a collector’s piece. Buy a high end hi-fi turntable. Set it up at your Tiki Bar and put the record on. Follow directions above.